Can Project Biro help Africa to overcome its maritime security challenges? A conference held on Project Biro in Simon’s Town last month marks an important step for improving South Africa’s maritime security. Project Biro refers to the South African Navy’s planned acquisition of six new patrol vessels. 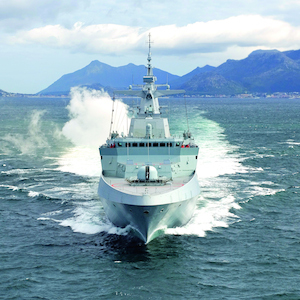 The three-day bidder’s conference, organised by the Armaments Corporation of South Africa (ARMSCOR), attracted significant local and foreign shipbuilder attention. Interested shipyards will soon submit tenders to build three inshore patrol vessels (IPVs) and three offshore patrol vessels (OPVs). If fully implemented, Biro will result in the South African Navy acquiring these vessels by 2018. Project Biro’s expanded capacity would then enable South Africa to mount cheaper, more focused and more effective missions and operations against the threats and challenges it encounters in its maritime domain, especially illegal fishing and trafficking. This improved capacity will be of immediate and immense national benefit. Of particular interest will be the possible impact on maritime security in the Southern African Development Community (SADC), the rest of Africa and beyond. The IPVs would patrol South Africa’s coast and territorial waters for criminal activities, while the helicopter-equipped OPVs would have the ability to operate further out into South Africa’s exclusive economic zone and the high seas. While IPVs and OPVs are not dedicated war-fighting vessels, they can be outfitted with weaponry if necessary. South Africa needs Project Biro to better police its huge maritime domain, which is 1 553 000 square kilometers in size and often labelled its ‘10th province’. Claiming sovereignty over such a large area also gives South Africa substantial international duties and obligations, as recognised and envisioned in the Defence Review. These include search and rescue, hydrography, disaster response and assistance, peace support operations and naval diplomacy. Participating in maritime regimes such as the United Nations Convention on the Law of the Sea, the Safety of Life at Sea and Convention for the Suppression of Unlawful Acts against the Safety of Maritime Navigation requires substantial maritime, especially naval, capacity. Why has it taken so long to implement Project Biro? This can largely be attributed to the legacy of South Africa’s 1999 arms deal, which made additional military purchases economically impossible and politically difficult to justify. The navy planned to incorporate the vessels a decade ago, but was unable to do so given the depth of the scandal. The vessels planned for in Project Biro would free up the navy’s existing small fleet of fatigued frigates from continuous patrol duties for which they were neither designed, nor purchased. Operation Copper has been a particularly important deployment – patrolling the Mozambique channel in partnership with Mozambique and Tanzania to deter Somali pirates who may pose a threat to Southern African ports and waters. South Africa’s four frigates – three aged but refurbished OPVs and the Drakensberg, South Africa’s logistical supply vessel – all participated in Copper. Biro will also be of interest beyond South Africa, where law enforcement could be aided with the use of OPVs. That prominence has been given to the need for local construction is especially welcome. It is also in line with the national and African priorities detailed in the government’s maritime development plan known as Operation Phakisa. This further complements the vision contained in Africa’s Integrated Maritime Strategy 2050 (AIMS 2050) of an African Blue Economy. A crucial part of this will be the creation of African shipbuilding and maintenance capacity. South Africa could provide useful lessons and expertise to the rest of Africa. African maritime security on the whole could also be improved with increased joint African operations and patrols. Many Africa states are currently purchasing various vessels or receiving them as donations. This often happens in an uncoordinated and logistically complicated fashion, however, without due regard for their commitments as part of AIMS 2050 or regional strategies. Recent IPV and OPV purchases have also proved controversial. Mozambique’s overly expensive and excessive vessel purchases from France raised concerns about their ability to afford and operate the vessels, while Nigeria’s acquisitions of overpriced hulks are suspected to have included some degree of corruption. South African-located shipbuilding companies will therefore be looking to expand business to offer alternative deals, demonstrating to SADC member states and beyond that patrol and law-enforcement needs can be met, perhaps through Biro-style partnerships with South Africa for constructing their own OPVs. In this way, Biro could lead onto the creation of the African maritime ownership and agency called for in AIMS 2050 and envisioned in that well-worn phrase ­– ‘African solutions for African problems’.